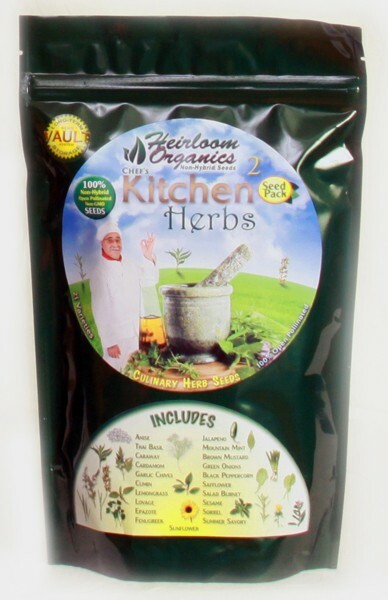 The Professional Kitchen Herb Pack from Heirloom Organics provides 21 completely new varieties not included in the Family Kitchen Herb Pack! Any home can have the benefit of a professional culinary herb garden with this extensive and well-selected collection of non-hybrid kitchen herb seeds. If you are serious about cooking or culinary herbs, you need both the Family and Professional Packs of Kitchen Herbs. The Professional Kitchen Herb Pack combines some of the most popular herbs for the kitchen our customers have asked for like mint, black pepper and yellow mustard, as well as some of the harder to find varieties like sesame, lemongrass and anise and even more ethnic and exotic varieties like cardamom, jalapeno chili and epazote. If you are appreciate flavorful food you should have both the Family and Professional Kitchen Herb Packs. Though often compared to Fennel, Licorice and Tarragon, Anise has its own unique flavor that has been enjoyed around the Mediterranean and North Africa for thousands of years. The Romans placed such value on Anise that it was occasionally traded as a currency. Anise is most commonly used as a flavor in sweets and confections, and over the centuries has also been added to perfumes and breath fresheners. Thai Basil is unique among basil cultivars for its sweet, almost minty flavor. Like other basils, it is hardy to a wide range of conditions and once established will provide a steady supply of flavorful leaves throughout the growing season. Most commonly found in the cuisines of Eastern Europe, Caraway seeds are often added to breads, cakes, soups, cheeses, cabbages and other dishes to add a distinct and pungent flavor. It has been used for thousands of years, and by some accounts is the oldest known condiment. Interestingly, this seed was once a key ingredient in love potions as it was once said that anything containing Caraway could not be stolen. Cardamom is among the more popular aromatic herbs used today, with the seeds adding a uniquely sweet quality to many popular commercial beverages and other products. More traditionally, this botanical has been enjoyed in its native India for thousands of years in a wide array of dishes, deserts and teas. Cardamom was so revered in Scandinavia that following the opening of trade routes between the two regions, it quickly came to define the flavor of many traditional Nordic breads and sweets. Popular in the cuisines of Asia, Garlic Chives are sometimes used in place of regular chives or green onions to provide an extra shot of garlic flavor. Fast growing and aromatic, this annual herb produces showy white flowers, which can double as a mild seasoning when dried and crushed. Cultivated for millennia in North Africa, the Mediterranean and modern-day Iran, Cumin is now an essential flavor in the cuisines of Europe, India, Mexico and elsewhere. Seeds of this parsley family member have been recovered dating back more than 4000 years, and the seeds of this herbaceous annual are believed to be the second most popular spice in the world. The leaves can also be added to salad and impart a mild tangy flavor. Epazote is used in many traditional Mexican dishes including tamales, mole de olla, salsa, traditional black beans and enchiladas. Eaten fresh, it has a distinct strong and pungent taste and aroma that can be reminiscent of a wide variety of other tastes including: citrus, anise, fennel, mint or tarragon. Needless to say, Epazote can be an acquired taste. In Mexico, it is sometimes consumed as a leaf vegetable but more commonly dried and used as an herb. Fenugreek has traditionally been used in the preparation of pickles, chutneys and curry powders in its native India, where is has been used as a nutty and slightly bitter culinary seasoning for thousands of years. While the seeds are the most known and commonly used part of the plant, fresh Fenugreek leaves can make a flavor addition to salads or other raw dishes or dried and used with meat or poultry. Jalapeños and other red peppers, have been cultivated by man for over 7000 years, with fossil records indicating a history of human use extending back at least 2000 years prior to that. They are native to Central America where they have been prized for the heat and flavor they bring to the local cuisines. Adaptable to a wide range of conditions, Jalapeños are also prodigious producers, with a single plant capable of producing 35 or more fruiting pods. Lemon Grass is native to India, where the tangy citrus flavor provides mild relief from the sweltering local climates. Although it is most commonly added to curries, soups broths or as a tea, it can also add an exotic touch to poultry, fish and other main dishes. Relatively easy to grow, Lemon Grass is a tall grass family member that is perennial in warmer climates. Also known as love parsley, Lovage is a hardy perennial herb has an odor and taste that are often compared to parsley and celery. Nearly every part of this plant has found some culinary application over the centuries. The leafstalks are most commonly is the stalk which is often used interchangeably for celery. Additionally, the leaves can be added to soups, stews and other vegetable dishes while the root is sometimes grated and added to salads, icings, syrups and other concoctions. Lovage is also noted for its high content of quercetin, a plant flavanoid believed to have strong anti-inflammatory and antioxidant properties. Pungent and with a strong minty aroma, Mountain Mint can be used to flavor dishes such as lamb, fish, poultry & sauces, and can also be used in sweets and confections. Native to North America, Mountain Mint is also said to be a helpful addition to the herb garden for its ability to repel unwanted insects and deer. Mustard has been used as a seasoning and condiment for at least 2500 years, with the pungent and spicy taste of this seed finding favor in many cuisines across Europe and Asia. Today it is commonly mixed with water, vinegar and other spices to produce the popular condiment that is used to dress up sandwiches and other foods. Aside from its considerable culinary prowess, mustard seed is said to bring luck, and if worn or carried, protection from harm. Scallions, or Green Onions, are milder than their larger cousins are a common component in many Asian cuisines. Most commonly they are used in stir-fries, soups, curries, noodle and seafood dishes and salads. Easy to grow and quick to harvest, Green Onions are versatile and simple way of bringing traditional onion flavor to your kitchen. Black Peppercorn is native to India, where the seeds of this flowering vine have been used as a seasoning for thousands of years. Today it is the worlds most commonly traded and used spiced, pairing with salt on dinner tables across the US, Europe and elsewhere. Piper nigrum can also be used to produce white pepper by removing the dark outer seed coat, or green pepper by harvesting and drying immature seeds. Safflower was once used as less expensive replacement for Saffron, from which the name of this herbaceous annual is derived. More commonly, the seeds are pressed into oil that is used much like sunflower oil. The tender shoots also have use in salads and raw dishes, while the seeds may be consumed raw or roasted and added to cooked dishes. Salad Burnet is commonly used in salads and dressings, where it is enjoyed for a taste that reminds some of cucumber. Native to Europe, it is hardy to a wide range of conditions and will grow to a height of 16 inches or more and grow tiny white flowers. Summer Savory is popular along the eastern regions of Canada, where it is used in place of Sage to flavor various meat and poultry dishes. Bright, pungent, and slightly sweet, Savory has also been utilized in the cuisines of Europe, notably France and Bulgaria where the dried and crushed leaf is a popular table condiment. Sorrel has been cultivated across Europe and North Africa for centuries, and the leaves of this hardy herbaceous green are most commonly used to impart flavor to soups, salad, and fish in French cuisine. In smaller quantities, the taste reminds some of citrus fruits or wild strawberries, with a slight edge. Sorrel leaves were used by the Romans to impart sharpness or acidity to foods. Caution: Sorrel should only be consumed in small quantities to add flavor. In large doses, the presence of oxalic acid can be fatal. Tall and proud, Sunflower makes a stunning addition to the garden. In this pack, we offer Fat Mama seeds, a variety that produces massive flower heads and extraordinary yields of sunflowers that are delicious fresh, dried or pressed into oil. A hardy and quick grower that is sure to add cheer to the summer garden.